Mahir Jethanandani is a graduate student studying Computer Science, Statistics, and Economics at the University of California, Berkeley. He previously worked at the University of California, San Francisco Department of Neurology and Bioinformatics as a Machine Learning and Bioinformatics Research Intern. 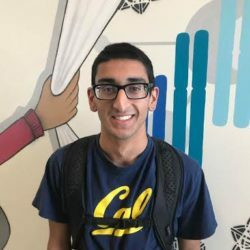 Mahir also interned at 23andMe as an Engineering Intern, exploring the world of personal genomics and its application to computer science, machine learning, and bioinformatics. Mahir graduated from UC Berkeley where he triple majored in Computer Science, Statistics and Economics. He is the author of “The Immaculate Investor” and “The Balance Sheet of Earth”. Mahir has worked with Benetech where he did volunteer work with Google for the United Nations. He is originally from Saratoga, California, and became inspired to explore genetics and bioinformatics after the passing of his grandfather.